there are many things in our life which could be lost sometimes intentionally and sometimes due to ignorance. these things could be materialistic or personal.but today I would like to talk about a thing which I have lost due to my mistake which I did not do intentionally.it was my personal laptop which I lost when I was doing my graduation from dm college moga.i not only lost my laptop but some other important things also because all these things were in a single carry bag. I was going to Panjab University Chandigarh due to some work. when I started my journey from home I put my laptop, some floppies, some DVDs in a bag. these floppies and DVDs contain my assignment files related to my study. my laptop also contains many types of personal data like pictures, videos, songs, some confidential data. when I boarded the bus from bus stand Moga I placed my bag beside me. until I reached Ludhiana everything was ok. but as long as the bus proceeds towards Chandigarh the number of passengers also increases in the bus. when I reached Chandigarh bus stand sector 44.i was in a hurry and I forgot my bag on the bus. I came to know about my bag when I boarded the local bus of Chandigarh transport undertaking. I immediately realized my mistake and at once left the bus. then I took an auto and reached the 44 sector bus stand. I approached the bus counter and met the conductor but they showed the ignorance about my bag.i felt helpless on that day.that was an unforgettable moment for me which still upset me when I remember. 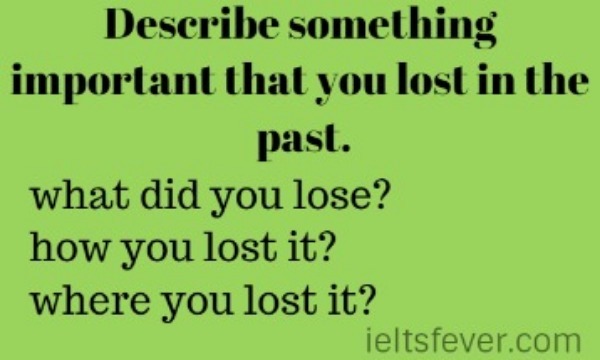 Q-1 what do you feel when you lost something important for you? Ans: I feel very sad and upset when I lost something very important to me.i remember when I lost my laptop I felt upset for many days. the thing haunted me most that how I could be so careless in preserving my important things. moreover, my brother gave me that laptop and I have deep affection attached to that laptop. Q-2 what did you learn when you lost something important? Ans: I learned a lesson that we should be very careful about our important things. instead of repenting at last after losing our things, we should know the importance of these things and give them extra care.because one has rightly said that time and tide never comes back. Q-3 did you return someone’s important thing in your life? Ans: yes I remember the time when I was doing my graduation.i had gone to Panjab University Chandigarh. when I boarded the bus after finishing my work at the university, one girl had sat beside me on the same seat.she was looking a little bit tired and hold a file which has some educational documents.she slept on the way from Chandigarh to Ludhiana.i was travelling from Chandigarh to moga.when the bus reached Ludhiana I was sleeping.the girl left the bus in a hurry but forgot his documents. when I woke up I saw the documents. her name and phone number eas written on the file.so I called her and return her documents. Some people believe famous people’s support towards International aid organizations draws the attention to problems, whereas others think celebrities make the problems less important. Discuss both sides and give your opinion. Many animal species in the world are becoming extinct nowadays. Some people say that countries and individuals should protect these animals from dying out, while others say we should concentrate more on problems of human beings. Discuss both views and give your opinion. In the past, people wore traditional clothes, spoke languages and practiced activities as dictated by their regional culture. These days, the world’s cultures resemble one another quite closely. Do you think this is a positive or negative development? Describe something important that you lost in the past. Describe something important that you lost in the past. Describe something important that you lost in the past. Describe something important that you lost in the past. Describe something important that you lost in the past.